Often when looking for a children’s party entertainer, people search for a children’s party magician. Over many years I have found that children can quickly become bored with watching an adult trying to impress them by showing how clever he is, so I don’t do much magic. Instead I work with what children really enjoy, which is sillyness, slapstick, and audience participation. So rather than referring to myself as a magician, I use the the term ‘Funnyman’. His real name is Mike (in case you don’t like asking for a buffoon when you phone) and as well as being an experienced entertainer, he’s also a children’s author, poet, musician, and Alexander Teacher. He’s been an art teacher too, and before that in the distant past he was a research scientist. He also uses the stage names ‘Professor Paradox’ for shows for schools, theatres and festivals, and ‘Will B Curious’ for his science show for primary schools. He trained in mime, movement, and physical theatre with some of country’s top theatre performers, and is pretty good at magic tricks if you can persuade him. He is sometimes available for workshops for adults. In the past he’s appeared in TV dramas, arts documentaries, theatres, schools, village halls, and live at the Theatre Royal with the English National Ballet! William B Curious – Will B Curios for short – A curious character who performs educational shows for schools, based on the national science curriculum. One Man Banned – Yes, you’ve guessed, he plays a one man band with guitar, drum, cymbal, kazoo, mouth organ, and a fairy decent singing voice. A great selection of foot tapping, good time, stomping rock and roll music. Jean Paul Fromage – A French waiter who used to be seen serving snails in restaurants until he got thrown out. Nathaniel Hornblotton – Romantic poet, well sort of romantic. 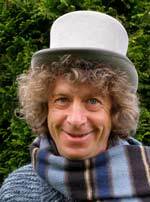 Professor Paradox – A clown like no other for festivals, schools, and parties. Dorothy Gallbladder-Smythe – The less you know about her the better! Entertainment for children’s parties is generally available in Somerset and parts of Devon, Dorset and South Wiltshire. Towns include Bristol, Bath, Bradford on Avon, Bridgewater, Bridport, Bruton, Burnham on Sea. Castle Cary, Cheddar, Chard. Dorchester, Exeter, Exmouth, Frome, Glastonbury, Honiton, Langport, Lyme Regis. Radstock, Shaftesbury, Shepton Mallet, Sherborne, Sidmouth, Somerset, South West England, Somerton, Street, Taunton, Tiverton, Topsham, Totnes, Trowbridge, Warminster, Wellington, Wells, Weston-Super-Mare, Weymouth, Wincanton and Yeovil.